Positive: Decent hardware; nice design; compact size. 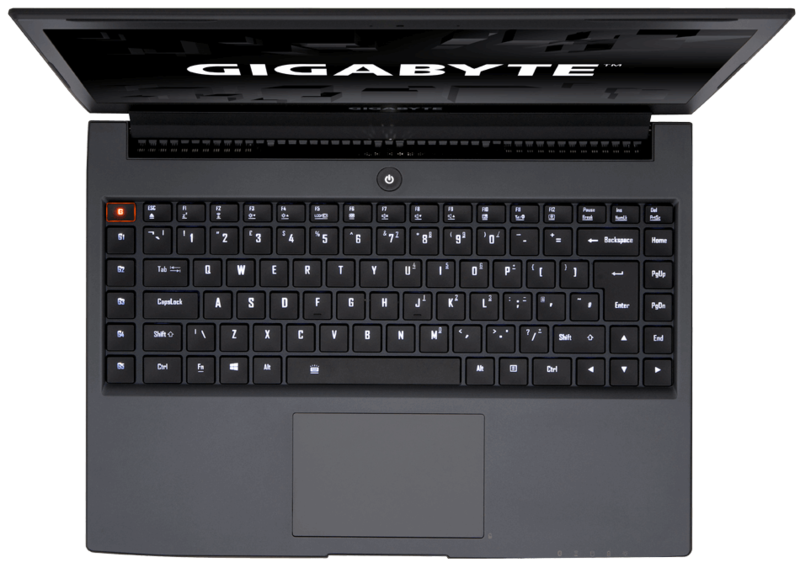 Series: With the Aero 14 series, Gigabyte aimed to create gaming and multimedia laptops, which are as powerful as a gaming desktop, Gigabyte manufactured the Aero 14 series. The Gigabyte Aero 14 series consists of premium laptops with exceptional features, yet in a less-than-2-kg-weight package, so it could make user feel more comfortable and convenient when traveling anywhere. The powerful yet light 14-inch laptops are slightly cheaper than the MSI GS43 and the high-end Razer Blade. This series is equipped with powerful processors, supreme graphics cards and an SSD, for instance, the Intel 7th generation Kaby Lake i7-770HQ processor or the NVIDIA GeForce GTX 1060 discrete GPU. Actually, in my viewpoint, the Gigabyte Aero 14 is easily able to take advantages when vying with other competitive models or series in the same market segment currently. According to page TechRadar, Gigabyte laptops have always looked so minimalistic to a fault that the Aero 14 is straight up stylish. “I personally quite like the matte black design - although the orange and carbon-fibre trim looks like a bit of an afterthought”, said the reviewer from page TrustedReview. Also, for the page UnlockedNewEgg, they thought that a unique and powerful laptop like the Gigabyte Aero 14 shouldn’t have to apologize for the strange design choices. A comment from page ComputerShopper about the outfit of this notebook is that the orange and green versions may not fit with corporate office decor, but the black Aero 14 is handsome enough to blend in at work as well as play. Besides, “The Aero 14 measures a hair under 20 mm thick and tips the scales at 1.9 kg. It isn’t the thinnest nor lightest laptop of its size, but considering the firepower within, the dimensions are perfectly acceptable and the system easily slips inside a backpack” (from page Hexus). Nevertheless, as another remark from page TrustedReview, there are not any major concerns with the design and build of the Aero 14, although past experience has found that Gigabyte laptops built in this way tend to start looking a little worn after less than a year of use. In the viewpoint of Hexus’s reviewer, more importantly, build quality is similarly satisfying. Gigabyte has enough aluminum reinforcement to ensure that there’s only a minor amount of flex to the keyboard tray and the system feels sturdier than the plastic chassis many gamers are accustomed to. Speaking about the keyboard, page UnlockedNewEgg evaluated that it’s a pretty nice compromise between traditional keyboards and mechanical. It features some feel-good clicking, though some didn’t quite like how it felt But as remarked from Hexus, the Aero’s 14 keyboard is well	-sized with good key travel and a consistent white backlight, but the layout can take a little getting used to. In addition, following a comment of TechRadar, the keyboard features a new and larger island style with significantly bigger keys and more spacing between each key. The key switches feel bouncy and offer firm resistance while typing. “The keyboard has an extremely firm action; you’ll need to put more force into each key press than is usual. I really like this, although it takes some getting used to”, said TrustedReview. Meanwhile, “The trackpad isn’t anything exciting, but it works better than some truly vestigial pads on gaming laptops. It gets the job done, but isn’t as large or responsive as others out there” (UnlockedNewEgg’s evaluation). Moreover, the touchpad, as a remark of TrustedReview, is an integrated affair with no separate physical buttons. It’s fine, but it is not Microsoft Precision-certified, so we don’t get that immediate, perfectly weighed feel that you get on other laptops. And for TechRadar, “Just below that, you’ll find a generously sized and silky smooth trackpad. Unfortunately, the Elan software driving this pointing device left us with fewer multi-touch gestures than we’ve become accustomed to with a Microsoft Precision Touchpad”. Regarding a quote from Hexus, a well-sized trackpad make us feel nice to the touch but can be a tad erratic during use. The screen on the Aero 14 offers a fine balance of resolution and quality, with a high-resolution 2560x1440 panel that looks excellent under scrutiny like TrustedReview’s comment. Similarly, Hexus also said, Gigabyte employs an IPS panel from LG offering excellent viewing angles, a matte finish and a QHD resolution that’s ideal for a 14-inch screen. And the reviewer of ComputerShopper said: “We have nothing bad to say about the Gigabyte’s screen. Colors, contrast and viewing angles are all impressive”. As TechRadar’s comment, the Aero 14’s screen is top notch. The display panel is so brilliant that 50% screen brightness is enough to overpower sunlight streaming into our office. Unfortunately, following a quote of TechRadar, the Gigabyte Aero 14-inch notebook’s speakers don’t leave as nearly as big an impression. They’re serviceable enough for playing music and game audio when we don’t feel like putting on a headset. Speaking of sound, the speakers are in the middle of the pack. “For a laptop with a fat battery and fat performance, getting phat beats like it’s the 90’s is challenging. I wouldn’t give it any awards, but it got the job done and, in laptops, that’s good enough” (page UnlockedNewEgg). However, for TrustedReview, surprisingly, the speakers are perfectly fine. While the reviewer of this page wouldn’t want to play sound-critical games through them, there’s stereo separation and a reasonably well-balanced sound and they can get up to a pretty high volumes too. Most new laptops in the Gigabyte Aero 14 series are powered by the latest Intel’s Core i7-7700HQ from Kaby Lake: a quad-core, eight-thread CPU with 2.8 GHz (3.8 GHz turbo) clock speed. And the others older are equipped with the quad-core Intel Core i7-6700HQ from the Skylake generation. This helps in tasks such as video rendering and photo processing, as does the generous 16 GB of 2133 MHz RAM. This performance shone through in the Geekbench 4 benchmark, in which the Aero 14 scored 4229 and 12903 in single-core and multi-core tests, respectively according to TrustedReview. Also from this page, the NVIDIA GeForce GTX 1060 graphics card on board of the Aero is close to identical to its desktop sibling, and performs similarly as well. Loaded with 6 GB of GDDR5 memory, this chip is capable of powering the latest games at Full HD resolution and high settings without breaking too much of a sweat. As a result from page Hexus: “Getting in excess of 60 frames per second is achievable in most modern titles if you knock the resolution down to full-HD. It isn’t quite so easy at native QHD, you may find you’ll need to drop quality settings in order to get silky-smooth action at the highest available resolution”. For the TechRadar, they reviewed by playing The Division and they could get 52 fps for 1080p Ultra and 112 fps for Low 1080p, GTA V 1080p Ultra reached 39 fps and 115 fps for Low 1080p, respectively. And the UnlockedNewEgg showed a result that the Aero was hitting 65-70 fps with 1440p resolution. Dropping down to 1080p resolution bumped the frames up to 100 fps on Epic Mode in Overwatch. “Heat-wise, the bottom of the Aero does become fairly toasty when gaming, which isn’t surprising. I’d suggest gaming with it on some sort of lap tray to help with airflow - and to keep your knees cool”, complained TrustedReview. Notwithstanding, the page Hexus gave a viewpoint that the system of the Aero 14 series becomes noticeably warm when gaming, but the fans do a decent job of expelling heat and, to our pleasant surprise, noise output isn’t obnoxious. The laptop is quiet enough when idle and though the fans can be heard clearly when either processor is placed under significant load, noise isn’t likely to be a major issue during general work. About battery life, the reviewer of UnlockedNewEgg found that Gigabyte did a great job with battery management and performance throttling to dial in performance depending on needs. In his opinion, being able to crank out a few rounds of Overwatch plugged in at an airport and then have enough battery life for a 5-hour flight is pretty much impressive. And for TrustedReview, the Gigabyte Aero 14 managed 8 hours and 20 minutes in his very light Powermark battery benchmark, and in regular use he found he could get between six and seven hours. Also, as an evaluation of TechRadar, the portable rig lasted longest during their movie benchmark test, which loops a locally stored 1080p movie at 50% brightness and volume for 4 hours and 49 minutes. On the contrary, “Our battery rundown test entails looping a HD movie clip with 50% screen brightness and all wireless radios disabled, and in this scenario the 14-inch Gigabyte machine managed to keep going for the best part of nine hours” (Hexus’s quote). Overall, as a verdict on page TechRadar, Gigabyte’s gamings laptop have always offered outstanding performance packed into a thin frame at an affordable value, and the Aero 14 is not an exception as well. Particularly, this series stands above its peers with the better benchmark results, yet at a considerably lower price. There are a lot of advantages of the Gigabyte Aero 14, such as: the lightweight and thin design or the 190-degree display hinge. Furthermore, this laptop has not only the solid gaming performance with the Intel latest powerful processor but also the handsome Quad-HD IPS display. However, if there is a flaw of the Aero 14, it might be the unexpected audio, which is weaker when compared to the whole device generally. Yet, in general, it is a thin and light gaming laptop that doesn’t cost the earth, as a conclusion from TrustedReview, that’s worth celebrating. “Gigabyte’s understated Aero 14 is a sleeper in performance laptop market. It’s undeniably a Macbook Pro killer”, the UnlockedNewEgg concluded.